Over three decades working around the world in microfinance, I’ve watched countless women take small loans and use them to launch flourishing businesses and improve the wellbeing of themselves, their families and their wider communities. The reasons why women in the developing world are, and should be, the main recipient of loans is well documented. Women are far better financial agents than their male counterparts: they’re reliable, driven and spend their money in ways that are beneficial to others as well as to themselves. These qualities, which microfinanciers have long celebrated for giving women the ability to transform lives on a community level, are now becoming the defining traits of female business leaders with limitless potential. It’s hugely rewarding and hugely encouraging, therefore, that in Africa in particular, we’re seeing female entrepreneurs evolve into potential titans of industry. 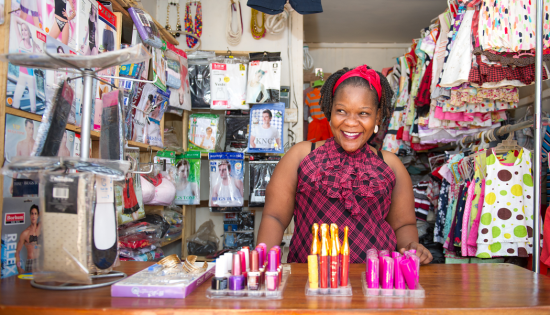 MasterCard’s Index of Women Entrepreneurs has found that in, for example, Uganda and Botswana, women are rising above unfavorable life circumstances to create the sorts of businesses that will drive growth throughout sub-Saharan Africa. But the story doesn’t end there. In Africa––as in many parts of the world––there is a ‘cap’ on female success. Stubborn structural limitations relating to supply chains, support services, and sponsorship among other areas mean that African female entrepreneurs can only go so far; this institutional sexism in many cases condemns talented and industrious female entrepreneurs to remain at subsistence level, unable to make the jump to larger business. These hurdles can be unsurmountable. The level of bureaucracy involved in gaining approval to manufacture food and beauty products in Nigeria, reports the Guardian, is almost impossible to navigate for someone who is poor, uneducated and has pressing familial responsibilities. In Nigeria as in many parts of sub-Saharan Africa, women are most likely to fit this description. And while FINCA and other institutions have worked, and are working, to provide financial support to women in Africa, a study by the African Development Bank shows the financing gap for women is still above $20 billion. There is, unfortunately but unsurprisingly, a great deal of societal sexism at play. Brenda Katwesigye, the founder of a Ugandan app that connects users to health centers, medical specialists and ambulance services, told Africa.com that ‘there are many times I have been called a “young girl” or inexperienced, for no valid reason at all.’ This kind of comment is reflective of social norms in the patriarchal societies of sub-Saharan Africa, where men continue to be seen as breadwinners and natural entrepreneurs, and women as caregivers. What is needed now is creation and development of supportive infrastructure so women at every level can pool resources, share best practices and innovate together, as well as the removal of gendered red tape and greater financial inclusion. In order to start businesses, women need to be banked and they need capital. Women have limited access to land and other forms of property that might usually serve as collateral for bank loans, and many are engaged only in informal and unsalaried or manual work. In these conditions, millions may be unable to find the stability or raise the money needed to run their own enterprise. How can this be achieved? Cultural practices are deeply rooted into many parts of African society still, and while financial empowerment can help lead to female empowerment and poverty alleviation, it is not guaranteed to change any longstanding cultural biases towards women or their role in society. To change this, we need to start the change process with people who have disproportionate influence in the organization. We need to look for ways to get people to experience the harsh realities that make change necessary. When I first started out in microfinance, the easiest way to make clear the benefits to a community of empowering women with capital loans was to show them how much more prosperous their lives had become once the finances were in the women’s hands. Culture change only happens when people take action. So, start there. While articulating a mission and changing company structures are important, it’s often a more successful approach to tackle those sorts of issues after you’ve been able to show people the change you want to see.